The Strictly Come Dancing pair are preparing for the final two shows on the 2019 live tour this weekend. 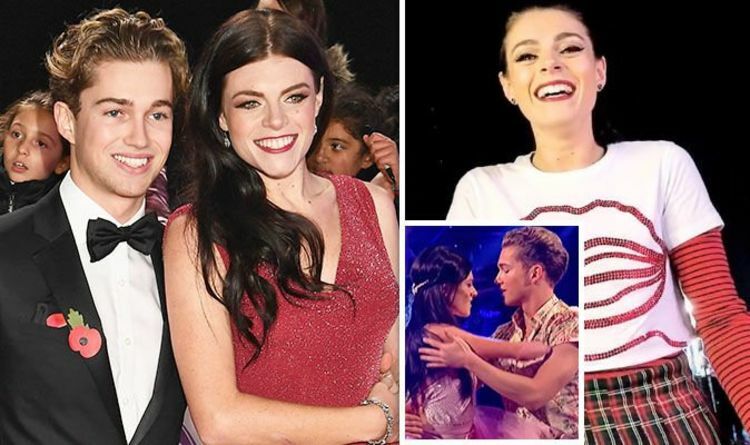 Having previously sparked speculation they could be more than friends, AJ Pritchard, 24, and Lauren Steadman, 26, were once again caught up in a romantic moment at a recent show after they performed their sweet and intimate Viennese Waltz for the judges and live audience. Following the routine, Darcey Bussell, 49, complimented the Paralympian on how far she has come since she first started training for Strictly last year. The former Prima Ballerina also said the dance had “plenty of romance”. According to The Sun, Lauren and AJ “squirmed” at the judge’s comment, with tour host Ore Oduba, 33, then quipping that Darcey was “reading between the dance lines”. The audience reportedly wolf whistled and cheered while the duo blushed. The British-born dancer previously told The Mirror he and Lauren had “grown close” and hinted at the possibility of them becoming more than friends in the future. “I am very protective of Lauren because we have worked so close together,” he told the publication. “There are different things that she will talk about in training that she would never talk about on camera. However, AJ Pritchard was recently reported to have kissed Caroline Flack at a National Television Awards 2018 after party. A source told The Mirror the pair were whispering, touching each other’s arms and “passionately snogging” at the bash. An insider subsequently told The Sun the dashing dancer was “mad” about Love Island host Caroline, 39, but that they were struggling to get together for a date due to his schedule on the Strictly tour. They were said to have been texting ever since the NTAs. AJ has also spoken out about his sexuality in an interview with the publication, saying he doesn’t think he should have to “define it”. “From the age of 12, when I decided to dance in high school, everyone was saying, ‘Oh, you’re a dancer…” he said. “And there was that kind of stigma about it. “I try not to think about it. I just live my life,” the Strictly star continued. “But the support from the gay community is always fantastic. “It’s great because they are always the best people to always be around. I love being around gay people, going to gay clubs,” he added. “Obviously in this industry there happens to be a lot more gay people, so it just seems to work perfectly — and it helps with the sales for the calendar,” he joked.